The Odes of Pablo Neruda. Example poems and picture book about his life to use when introducing this form of poetry to students. Diverse Books for Children: favorite author or illustrator. Great theme for the newest #diversekidlit! Come share a post or comment with your recommendations. 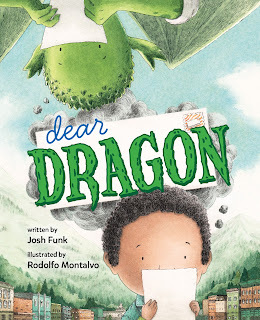 Dear Dragon: a pen pal tale (2016) by Josh Funk. So cute and clever. Some major miscommunications happen as human and dragon pen pals put their own lives into the letters from their new friends. A great conversation-started about prejudice and stereotypes! 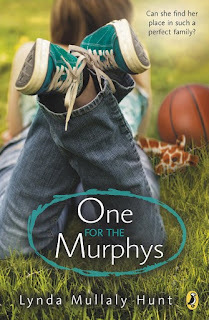 One for the Murphys (2012) by Lynda Mullaly Hunt. I'm trying to put together a series of book club book choices for my seventh graders. I'm looking for shorter books with plenty to think about and that deal with higher-level issues. I've read Fish in a Tree (which some of my students read last year), so I thought I'd check this one out too. One for the Murphys is the story of a girl named Carley who finds herself in foster care after she is beaten by her stepfather. This is a tear-jerker of a tale about family, friendship, and finding your own way. I have read some negative criticism about the depiction of social workers in the book, but I still think there is a lot to value in this story. What are your must-read or must-discuss books for middle schoolers? (Especially books they might not pick up on their own.) Others I'm considering include Tuck Everlasting, Paper Things, and The Fourteenth Goldfish. One for the Murphys is a book I keep meaning to read but haven't yet. I'll have to move it up higher on the stack. Here is what I read last week. Happy reading! Oh - great idea for your Book Club. Love One for the Murphys - I would also suggest Twerp, House Arrest, Counting Thyme, The Land of Forgotten Girls and A Night Divided. Great list, thanks! I have Counting Thyme in my TBR pile - we're going to Skype with the author in Feb.
Dear Dragon is so fun, and could be a great launching point for some fun classroom activities! I haven't read One for the Murphys, but it sounds powerful, and necessary. We read One for the Murphys a few years ago but it has stayed with us. What a powerful story. Thanks for telling us about Dear Dragon. We love Josh Funk's books. I loved One for The Murphy's, did not know about the criticisms, but my students loved it too when it came out. Others they liked were The Second Life of Abigail Walker, the "then" books by Eliot Schrefer (advanced readers). The War That Saved My Life is terrific, too. Love The War That Saved My Life. I'll look into the others too. The criticism wasn't huge, but an actual social worker pointed out a lot of ways where in the real world Carley would have been better-served/better-represented by the social work system. You may also want to check out Counting by Sevens by Holly Goldberg Sloan - really beautiful. Looks like the Josh Funk book would be perfect for our upcoming reading theme.